That’s what I am looking for. How to stable this thing on highways and on sharp corners, Im already using 175/70/13 tyres. By changing it to lower springs..
Any product you know? Kabli or new. If you live in Lahore then visit Bilal hung. Salam fellow pakwheelers. What acerage are you getting these days? Since last year my cars average suddenly dropped. I did everything but in vain but then 1 month ago I widened the plug space a little now it became 1-2 kn better!! I wanted to ask how much average ur getting I am getting 14-15 on ring road mostly and a few kms in city in peshawar. Secondly do you kbow where to buy that circled spark gap tool? Whats the quantity of gear oil required in WagonR, 2.0 or 2.2 litres ? t want to make it stable as much as normal cars like cultus. There is a noise in bumpy area from inside steeering area,i visited Central 3S and the guy said that due to "Lock (tri-circle lock) inside cross of steering", cross space has widened and that's the reason of voice. He said they will open the cross asembly of sterring and get-it narrow from "KHIRRAAD". I wnated to know,is it safe todo so? becz i have heard that once steering assembly is opened..it will not sit-back as orignal and will keep irrritating....KIIND SUGESTIONS pls. After opening stearing assembly it would become hard. Get the whole stearing assembly changed in warranty. Its just a cross which is faulty, what I got from your query. You can have a new cross from any market having kabuli parts (if in Lahore - Bilal Gunj etc. etc), however the existing cross can also be repaired by making some small welding spots to restrict its loosening effect. Getting out cross is nothing to do with steering assembly, just loose 2 x bolts, it will be out and re-install after repair or install a new one. Thanks alot. I think,you got it right. Coz the guy said k " taalaa laganay se cross loose ho jata hai aur widened bhi islye awazx ati hai specially bumpy area mien" , so get it repaired. I will visit them soon and get it repaired or install new one. One advise / precaution to be taken during repair, after or during openning of cross from steering column do not put key in the ignition, as if it will be made on by some one, it will break the plastic ring inside the steering which is having indicator circuit. So please make it sure at that time. Salam, Anyone know tyre shop in Faisalabad for genuine tyres? ? Also are stock alloy rims good for 175/70/R13? How to loosen the clutch on wagon r. It releases after quite a bit of distance from floor. 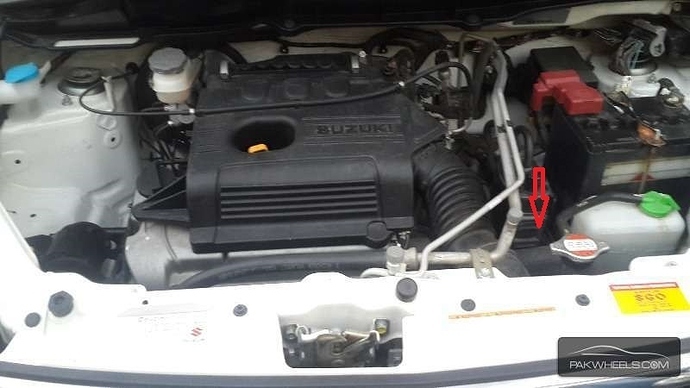 there is bolt and nut on very close to right side of engine with a plastic cap. remove the cap, loosening the nut will result in clutch going downward, tightening will result in clutch going upward. do you kno the price of fuel filter of wagon R?